Commanding in the nicest possible way, the 3-1/4x 3-1/4x 5" [!] 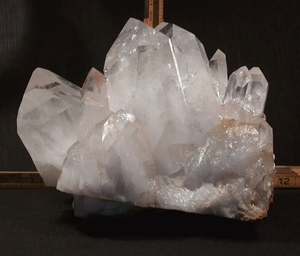 twins dominate this Arkansas rock crystal cluster of 8-3/4" wide by 7" deep x 7" tall. Other member crystals of this quartz cluster range from brilliantly clear to veiled with foils. More than plenty of rainbows to go around, shaded faces to see, penetrators and record keepers to count. Excavation damage, including missing crystals simply doesn't detract from the strength and motion of this great cluster, which has been priced accordingly. However: should peachy iron stain not appeal please ask for it to have yet another acid bath. Absolutely self displays on its' milk quartz/sandstone bottom. Sent doubly boxed with hand written description. Shipping will be added.